Ask any Search Marketer what the components of a good Internet Strategy are and inevitably Link Building always comes up. For good reason, Links are considered to be the foundation of the Internet. PageRank increased the value of links as the vanilla explanation of PageRank is that it’s a function of the amount and quality of the inbound links to a website. These inbound links are considered a vote in favor of a website. The anchor text of the link is used by Google’s PageRank to determine the area of expertise of the site being linked to. 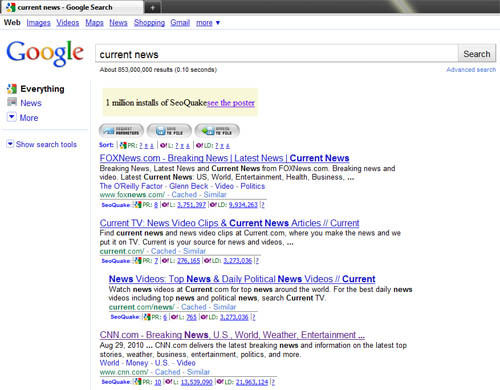 So when Google crawls an outbound link on a website like this: Current News – it follows the link assuming that CNN.com is possibly an authority for ‘Current News’. Google through it’s Wizard of Oz-like algorithms checks the content of CNN.com to see if it’s a match in terms of relevancy for the inbound link. They then determine a relevancy score and CNN.com is then given a weighted vote in favor of being an expert for ‘Current News’. Now that you understand the basic principle, we can get on to finding links for your own site. For the sake of this post I’m going to assume you’re familiar with the different types of linking and we’re going to focus on either purchasing the text link ad or requesting it for free. In fact I’m not going to get into the process of attaining the link but more about how to identify the sites worthy or requesting a link from. There are many different tools out there to help you, and every good Search Marketer should have a tool box full of tools. 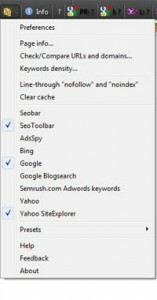 For this post I’m going to recommend that you have the SEO Quake Toolbar installed. We’re going to need to tweak the Toolbar so if you’re a master with SEO Quake, you can go ahead and skip to the section below. 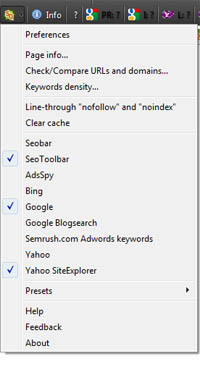 If you’re doing a fresh install of the SEO Quake Toolbar for Firefox here are a couple of initial settings that should be made, 1) Select either SEOBar or SEOToolBar, this will be the visual location of the bar, I use ToolBar; 2) You must select the parameter load settings, I recommend “by request”. This allows you to view the SEO Quake parameters on your own without pinging Google, etc each time you go to a page. 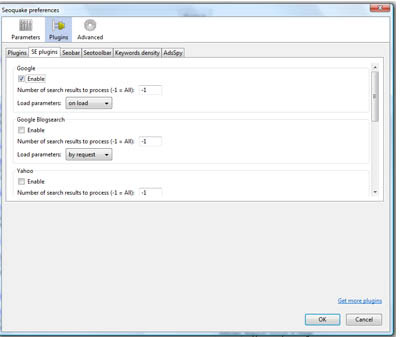 Now you must select the SERP viewing parameters, for this exercise select Google, and Yahoo Site Explorer. Then scroll down slightly for the load parameters, again select “by request”. You can always change these in the Preferences. These settings will insure that the Toolbar will stay on top of the page (or bottom of the header of your FireFox browser), that SEO Quake will show in Google SERPs, and it will also show in Yahoo Site Explorer results. This is very important when looking for new links. We have a couple more settings, bear with me, on the top of the menu that shows when you click on the SEO Quake logo you’ll see Preferences, select that menu. OK, select the SE Plugins tab, and in the Google section select “on load” for the Load Parameters. Please scroll down in that box for the Yahoo Site Explorer and do the same, select “on load” for the parameters. What we’ve just done is we’ve limited the number of parameters to be shown in the Google SERPs and Yahoo Site Explorer Results pages and then we requested that SEO Quake load the information immediately upon page load. If everything was set-up correctly you’ll see the search results and just below, you’ll see that SEO Quake has populated the Google PageRank, Yahoo Links to the Page, and Yahoo Links to the Domain. These parameters are what you’ll use to determine the authority of the page/site you want to request links from. Obviously any site ranking in the top 20 in Google for Current News (or your keyword) are going to be considered authority figures for that keyword. The reason Links to the Page are important is for an inside page of a website that has PageRank, you want to make sure the page has at least 10 unique links to avoid losing or shedding it’s PageRank. Do related searches for your keywords and also some fringe but yet related keywords because you’ll find your self running into competition and also sometimes the sames sites over and over again. It takes time and practice to know exactly what you’re looking for but once you get a few really relevant links you’ll see a quantifiable change in search rankings.